e-CAM21_CUTX2 Camera is suitable for smart surveillance and smart parking applications. Camera comes with S-mount lens and Jetson TX2 image signal processor. Product supports I2C interface and 4-lane MIPI CSI-2 interface. Unit feature ½.8 in. IMX290 CMOS Sensor that delivers video streaming RBG 10 bit at 120 frames per second and an option control exposure, brightness, contrast, saturation, white balance, gamma, gain and sharpness. e-con Systems Inc., a leading imaging solutions company and NVIDIA® Preferred Partner announces the launch of the much-awaited SONY STARVIS® series IMX290 CMOS Sensor based MIPI CSI-2 camera module for NVIDIA® Jetson TX2 developer kit – eCAM21_CUTX2. The STARVIS® is back-illuminated pixel technology used in Sony CMOS image sensors for Smart Surveillance camera applications. Its excellent low-light sensitivity realizes high picture quality in the visible-light and near infrared light regions. e-CAM21_CUTX2 produces outstanding visibility under the starlight. The IMX290 is a RGB 10/12-bit Bayer format image sensor that can stream 1080p @ 120fps. e-con Systems partnered with NVIDIA® to develop this camera leveraging the powerful Image Signal Processor of NVIDIA TX2. e-con Systems worked closely with NVIDIA on the driver development, image sensor characterization and ISP tuning for realizing excellent image quality under various lighting conditions including near darkness. The e-CAM21_CUTX2 camera is an ideal camera for smart applications powered by Machine Learning and Deep Learning technologies on the powerful Tegra X2 platforms including smart surveillance, smart parking and other innovative applications requiring cameras with excellent image quality. e-con Systems distributes a sample camera viewer, running on the Ubuntu distribution of Jetson TX2 development board, leveraging on NVIDIA's 'libargus' camera APIs that demonstrates the video preview and still capture capabilities. e-con's Full HD IMX290 camera module along with the adapter board allows developers to incorporate this camera in to their designs, in a turnkey basis, with ease. “As a Jetson Camera Partner, we are delighted to launch our first camera module leveraging sophisticated Image Signal Processor of NVIDIA Tegra X2. Combining our expertise in camera imaging technology with advanced ISP capabilities of NVIDIA Tegra X2, our e-CAM21_CUTX2 produces excellent images in low light conditions and supports 120fps in Full HD 1080p resolution. The e-CAM21_CUTX2 camera will be an ideal camera for AI-powered smart video/imaging applications based said Mr. Ashok Babu, President, e-con Systems Inc. “As NVIDIA Preferred Partner, e-con can also support virtually any image sensor utilizing the state-of-the-art ISP of NVIDIA Tegra CPU family”, he added. e-CAM21_CUTX2 is currently available for evaluation. 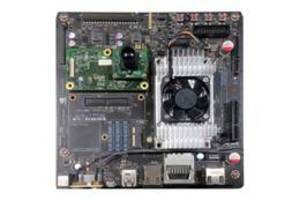 Customers interested in evaluating the eCAM21_CUTX2 with on NVIDIA® Jetson TX2 developer kit can order samples from e-con Systems’ online store https://www.e-consystems.com/webstore.asp#21CUTX2. e-con Systems Inc., NVIDIA’s Scaling partner, specializes in the design, development, manufacture of embedded OEM CMOS USB 3.0/USB 2.0 cameras, board cameras (MIPI/Parallel), Stereo cameras . We provides extensive range of high quality CMOS cameras (ranging 1 MP to 13 MP) based on Sony, ON Semiconductor and Omnivision sensors for various processors from NVIDIA, NXP(Freescale),Texas Instruments, etc. e-con Systems has strengths in customized product design and can offer fast prototyping and custom modification in hardware and software for any application.